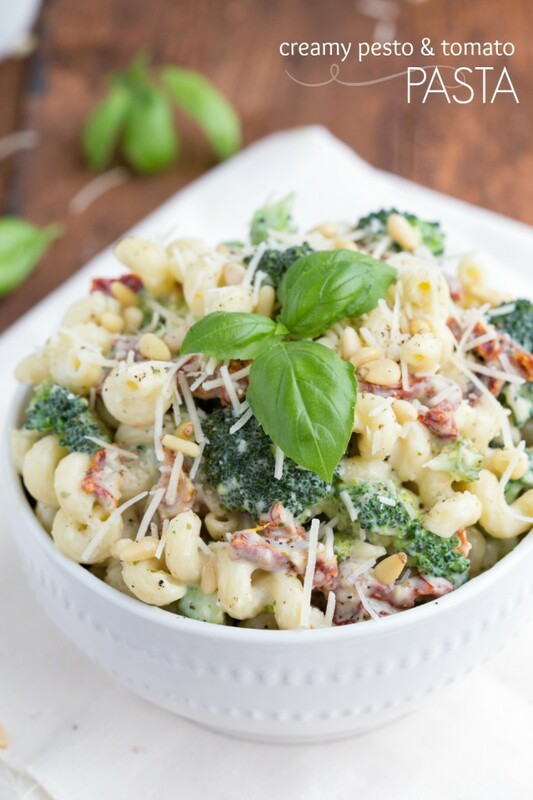 A creamy pesto and tomato pasta filled with broccoli and topped with fresh Parmesan cheese, pine nuts, and fresh basil. You will not believe how easy this dish it to make! When I first started experimenting with this recipe, I created and made my own pesto that got mixed into the sauce for this recipe. The next time I made it, I used a store-bought pesto. Making pesto isn’t hard at all and is pretty quick, but having something ready-made is always easiest. In attempts to make this recipe as easy as possible, I stuck with the store-bought pesto making this meal a 20-minute preparation. I love when dinner is ready that quick! 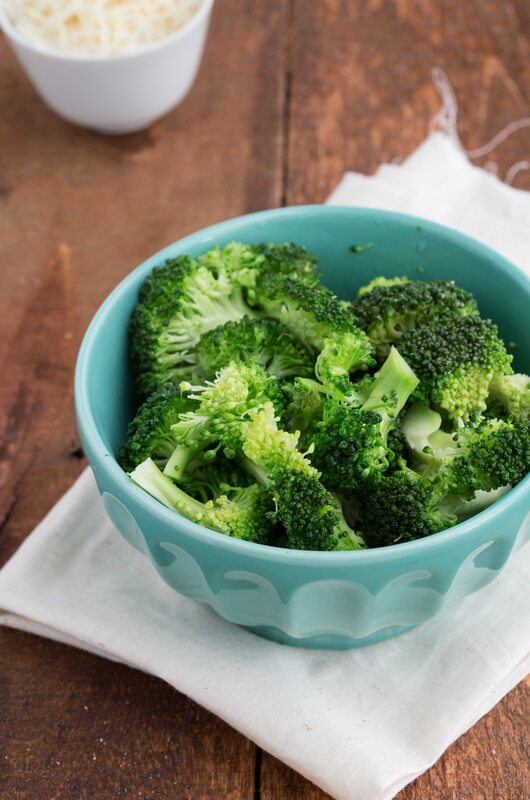 Steam the broccoli and mix with the pasta. Combine the pesto and heavy cream in a skillet over medium heat for a few minutes. Lower the heat, simmer, and stir occasionally until slightly thickened. Stir in the sun-dried tomatoes, freshly grated Parmesan, salt and pepper. 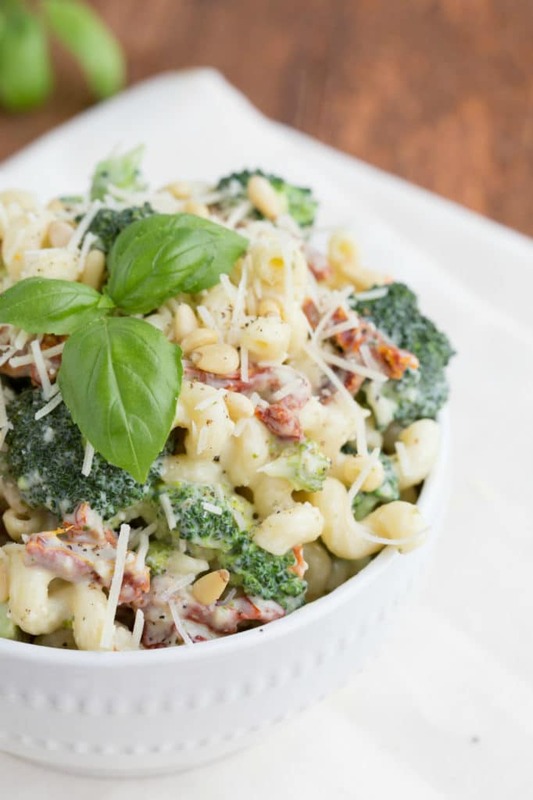 Toss the sauce over the pasta and broccoli. In a small saucepan over low heat, place the pine nuts. Lightly toast them until fragrant by stirring them over the low heat for about 2-3 minutes. 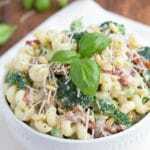 Top the pasta with the toasted pine nuts and an extra sprinkle of Parmesan cheese if desired. YUM! I love simple and easy recipes like this :). Fresh flavors and lots of creamy sauce! What a perfect looking pasta dish! And Sam’s Club is way too much fun. I always loved going with my mom when I was growing up!